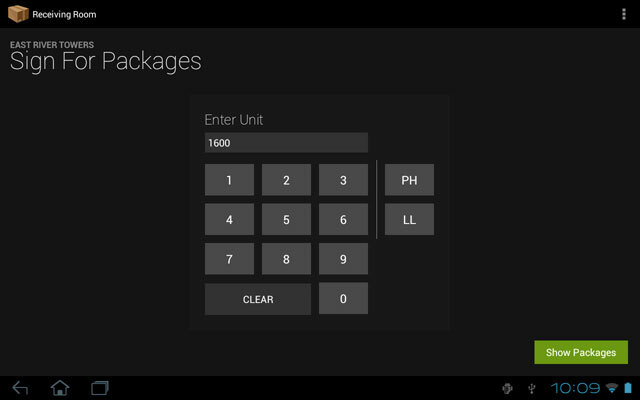 A package system from the ground up. With ReceivingRoom you have the freedom to keep your property management software and still use ReceivingRoom to handle package management. Our tablet software is designed by industry leaders from the ground up to make your process as efficient, accurate, and easy as possible. Forget about awkward desktop computer or web browser based solutions. Our app isn't a recent add-on or after-thought, it's crafted with attention to detail and takes packaging handling to a whole new level. 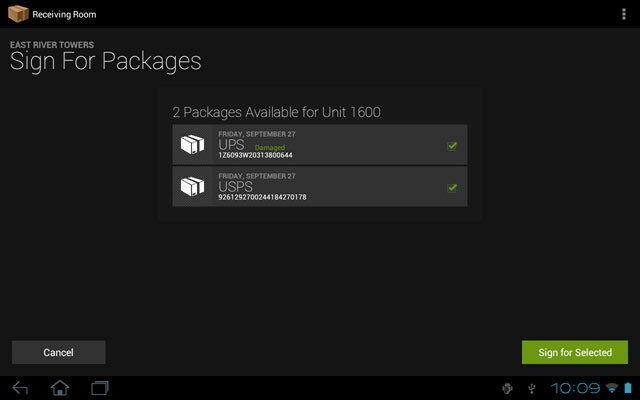 The unparalled tablet solution for managing package delivery and distribution. Simply use the tablet and barcode scanner to add tracking numbers for incoming packages, our smart software will automatically determine the shipping carrier and service for most common packages. Have a package stored in a fridge or on a loading dock? No problem just add a comment or location tag that will display at pick-up. Once the packages are logged, the intended recipients can be notified electronically via e-mail or text message (SMS). Messaging costs are included with our service plans. 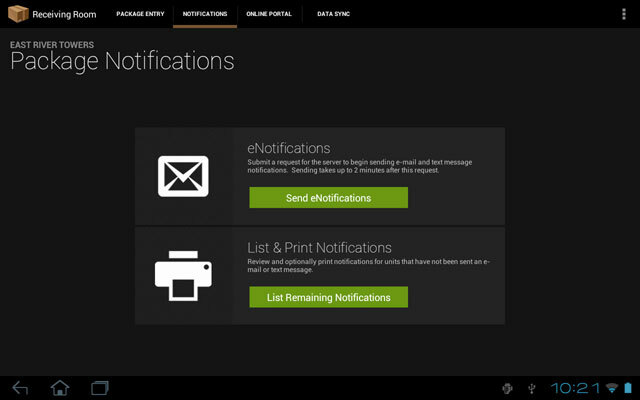 Notifications can also be made via an electronic display (television monitor) or mailbox slips which are quickly printed in unit number order by an ink-less receipt printer. 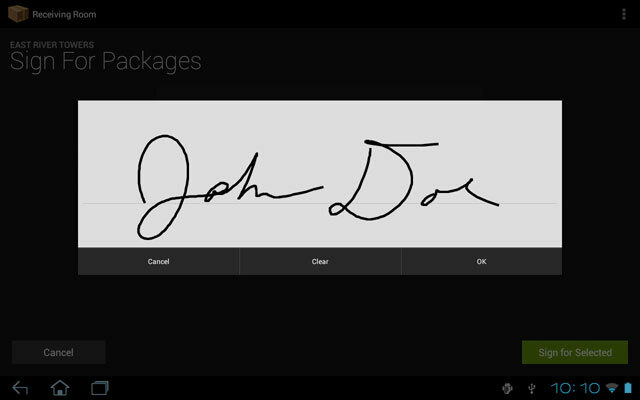 When packages are released a resident can quickly sign on the tablet. The signatures are available for review in our staff portal and are also included in printable package log reports. You'll know exactly when a package was received and exactly when a package was released to a resident. We moved our package reception from paper and pencils into a state of the art program that the resident find easy to use and they appreciate the ease of notification and pick up. The system is really seamless. We have multiple concierges...they pick it up in a few hours without mistakes. The residents love the service and it pays for itself many times over each month compared with when were hand logging and calling. Now no mistakes and great record keeping abilities. Serving buildings in the top residential property groups nationwide. Condo buildings and apartment buildings have turned to ReceivingRoom to improve their package process, save hours every week, and keep residents pleased with significantly modernized e-mail and text messaging communications. ReceivingRoom is a tablet system for managing packages that are delivered to a condo or apartment building and later released to residents. Building staff uses the tablet to log new packages with or without barcodes, then easily notifies residents about their package delivery. Later residents sign on the tablet acknowledging package receipt. All you need to get started is wireless internet access (Wi-Fi) where you plan to use the system. 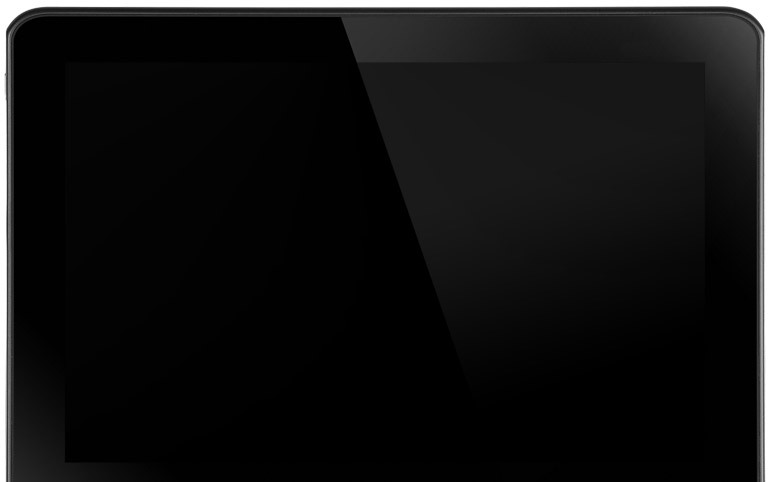 If you would like to print mailbox slips or use a television display, you can add that equipment at any time. Contact us with questions or to get your building started.  Copyright © 2011-2018 ReceivingRoom. All rights reserved.